Vocal criticism against the free culture movement comes from copyright proponents. Rick Carnes, the president of the Songwriters Guild of America, and Coley Hudgins, the executive director of arts+labs, an alliance of technology and media companies, claim that despite the free culture movement’s argument that copyright is “killing culture,” the movement itself, and the media it creates, damages the arts industry and hurts economic growth. In addition, some argue that the atmosphere of the copyright debate has changed, and that the free culture movement may have once defended culture producers against corporations, but now it is hurting smaller culture producers. Prominent technologist and musician Jaron Lanier discusses this perspective and many others critiques of Free Culture in his 2010 book You Are Not a Gadget. Lanier's concerns include the depersonalization of crowd-sourced anonymous media (such as Wikipedia) and the economic dignity of middle-class creative artists. In the news media industry, some blame free culture as the cause behind the decline of its market. However, scholars like Clay Shirky claim that the market itself, not free culture, is what is killing the journalism industry. ↑ "What does a free culture look like?". Students of Free culture. Retrieved 2009-10-24. ↑ "What is free culture?". Students of Free culture. Retrieved 2009-10-24. 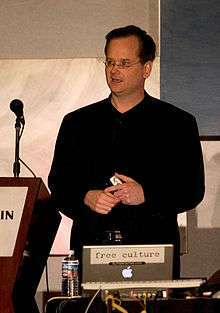 1 2 Larry Lessig (2007-03-01). "Larry Lessig says the law is strangling creativity". ted.com. Retrieved 2016-02-26. ↑ Baker, Ronald J, Mind over matter: why intellectual capital is the chief source of wealth, p. 80 . ↑ "Edge 338", Edge (338), retrieved 2011-04-23 . ↑ Wagner, R Polk, Information wants to be free: intellectual property and the mythologies of control (PDF essay), University of Pennsylvania . 1 2 Quart, Alissa (2009). "Expensive Gifts", Columbia Journalism Review, 48(2). ↑ David A. Wiley (30 June 2003). "OpenContent is officially closed. And that's just fine.". opencontent.org. Archived from the original on 2003-08-02. Retrieved 2016-02-21. I'm closing OpenContent because I think Creative Commons is doing a better job of providing licensing options which will stand up in court. ↑ Erik Moeller (2006). "The Case for Free Use: Reasons Not to Use a Creative Commons -NC License" (PDF). Open Source Jahrbuch. ↑ Benjamin Mako Hill (June 29, 2005). "Towards a Standard of Freedom: Creative Commons and the Free Software Movement". Mako.cc. Retrieved 2011-12-03. ↑ "Approved for Free Cultural Works". 2008-02-20. ↑ Samudrala, Ram (1994). "The Free Music Philosophy". Retrieved 2008-10-26. ↑ Nielsen Business Media, Inc. (18 July 1998). Billboard. Nielsen Business Media, Inc. ISSN 0006-2510. Retrieved 3 December 2011. ↑ Brett Watson (1999-02-10). "Philosophies of Free Software and Intellectual Property". Retrieved 2016-02-24. Is Software special? [...] So restricting modification is not necessarily evil when it comes to "articles and books"? Or does he just mean that we aren't obliged to let others misrepresent us? Alas, no mention of restricting verbatim duplication. Even Stallman's story on "The Right to Read" does not address the issue directly, despite being about IPR issues other than software. It extrapolates a dystopian future from our current position and acts as a warning about current trends, but offers no comment on the status quo. [...] There is a striking lack of discussion from the usual leaders with regards to the application of copyright in areas other than software. Raymond is mute, and Stallman mumbles. They both seem to view software as a special case: Raymond tacitly, and Stallman explicitly. ↑ Stallman, Richard (2009). "Ending the War on Sharing".